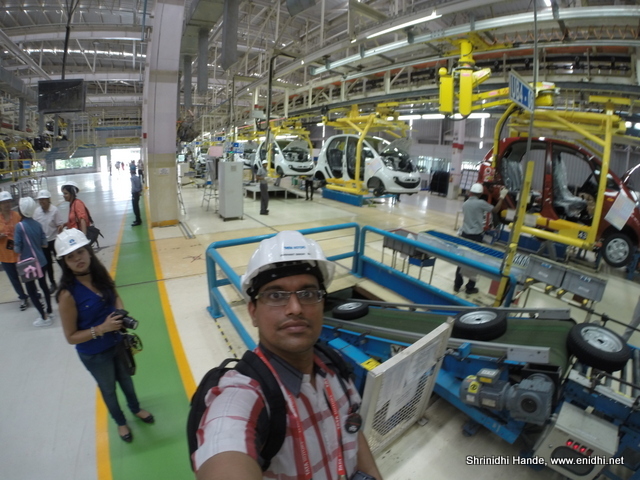 In 2010, during the Nano Superdrive, a month long country wide road trip of Nano was happening (for which I was one of the official bloggers) we had missed an opportunity to visit Nano factory in Sanand. We were flagged off from a Tata Dealership in Ahmadabad. 5 full years later, that wishlist materialized, thanks to Tata Motors #TheChosenOnes campaign and Indiblogger. After launching the new GenxNano in May this year (I had a unique chance to drive the new Nano before its launch thanks to Tata Motors and Indiblogger event at Pune, my post on which was identified as best post of the event) Tata Motors held a contest for those who purchased the new Nano- 20 lucky customers would win an all expense paid trip to Ahmadabad, get to visit Tata Motor's Sanand factory and get to see their Nano take birth first hand. 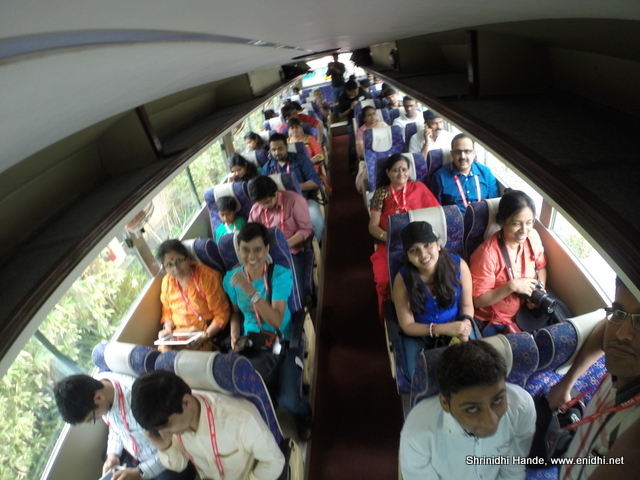 Besides the owners, about a dozen bloggers were also invited, via Indiblogger and I got lucky to be one of them. The lucky winners and hand picked bloggers will now onwards be referred to collectively as #TheChosenOnes. This was my third Tata Motors event in 2015, after SOUL Drive in January at Goa and GenX Nano meet at Pune in May. 6th evening there was a get together meet at Novotel, where we met Nano owners and their families (and of course Tata motors officials, event management folks, few Indiblogger team members and other bloggers). Famed Jose Covaco (pronounced Hose) was our host for the evening. There were a few fun games focused around Nano's key features, which I played with few Nano owner families. 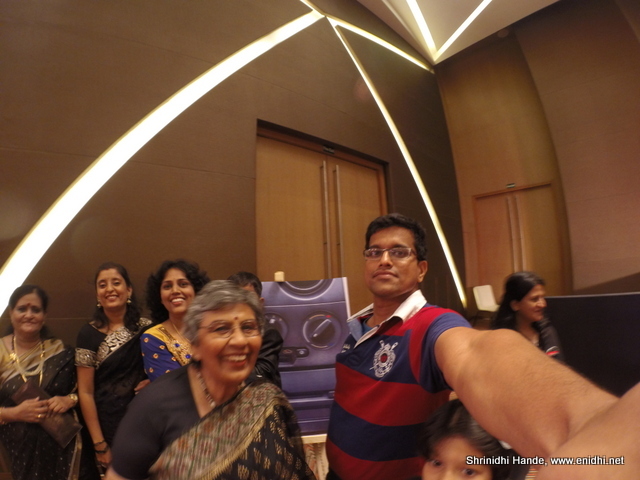 GoPro helped us in creating some selfies that were outcomes of the contest. We were given a mug with our face caricature on it. There was an activity for guests to pick up a mug, identify the person whose face is on it and hand it over to him/her. At least three people came to me with my mug but I said it is not me and sent them off. Later all fellow bloggers convinced me that it is me only, then I took the cup. Sorry for those who identified me correctly earlier. 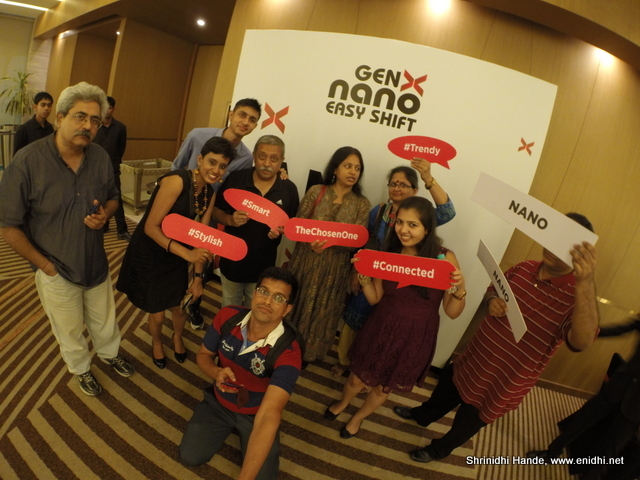 I spoke to few Nano owners- few had bought it for the first time, few already had previous editions and were upgrading. Everyone were very keen on Nano joining their family. 7th morning was the most awaited moment. We were all eager to visit the plant and get first hand experience how the Nano takes shape from a sheet of metal into a smart city car. We reached the Sanand plant and were given a Royal welcome- with made-in-china crowns, shashes and shower of glitter blasting around us. We were taken to the Nano room, where Tata Motors staff gave some brief about the Nano. Girish Wagh is one of the key person who was involved in the development of Nano, from the days of its conception and has worked closely with Ratan Tata in realizing the dream of Nano. Girish is VP & Head of small car projects at Tata Motors. He explained the trouble of Singur and effort involving in moving the factory from Singur to Sanand- it took 3340 truck load worth of transportation to dismantle an almost ready factory, bring it to Sanand and re-assemble it. Simultaneously Tata decided to make a few Nanos at its Pune and Himachal Pradesh plants, so that some cars can be released to the market to keep the promise made and to keep customer confidence intact. Thus what was supposed to be one project earlier, became three projects. We also learnt that the 1100 acre Sanand land was once owned by JRD Tata who had given it to the government. Every component, process and technology used in Nano has undergone several rounds of validation to ensure that it is the cheapest and most efficient way of doing things. Mr. Tata himself was involved in review of this and he even gave several ideas, including referring his helicopter seat to design Nano's seats. Mr Hemant Kulkarni, Plant head, Sanand spoke next. He spoke about the designs and prototypes considered before finalizing on current design. He also spoke about the Sanand campus and highlighted its key feature- no polluted water goes out of Sanand campus, part of electricity- about 15% is got from Solar, the man made lake and so on. Next we were grouped into Tata Aria taxies and were taken on the plant tour. We saw how steel sheets are cut and pressed into shape and then welded to form outer skin of the Nano, by a series of robots and very minimal human intervention. Paint shop is off limit for visitors and even the employees- everything happens there without any human intervention. Painted Nano shells are passed on to the assembly shop. Here we were allowed to walk on foot and even take photograph. Nanos are then fitted with electrical systems, interiors, steering, then finally engine and wheels. Everything happens in a well planned and highly optimized sequence that tries to save time and cost at every phase of production. Working at Two shifts, Sanand plant can produce 2.5 lakh Nanos an year but at present it is not running at its maximum potential but can be ramped-up as demand kicks in. Tata motors employees were with us to answer our questions. It was an overwhelming experience to see the smart small car take shape from scratch and finally roll out on its own. 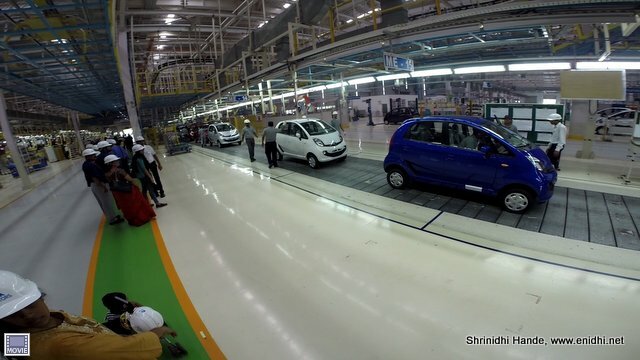 As someone following the Nano from its early days to recent development, being associated with various Nano and Tata motors events over time, I thoroughly enjoyed every moment spent inside the assembly unit. Visitors are not allowed inside the plant and photography is also prohibited- because the machinery and process used are sensitive IP of Tata motors. But the #thechosenones had special privilege of not only seeing the birth of Nano but also take photos and videos at certain places. So this visit is something I will be cherishing for long time. Once all done, Nanos move further on their own- they are subjected to a series of tests to check the suspension system, engine and all other aspects. Only after 100% perfection is achieved, the car gets its Tata Quality sticker. Later, the 20 owners who had seen their Nano take shape were handed over the keys to their Nano with a birth certificate for their Nano. I am sure each one of them will be very proud to have seen their car in making and take that special delivery. It now adds a whole new perspective to their idea of a car- it is not just a machine, it is like a family member whom they have seen take shape and come into the world. Be informed that they weren't just posing in-front of a random car. It is the exact car they will be driving. Owners could check VIN (Vehicle Identification Number) to be sure. I thought owners will drive it out themselves, but plant staff drove it out while owner and family could sit inside. Local RJ interacted with them, there were some photo ops and then we had a big group photo taken using drone. We saw Nano being tested on torture track (that simulates various real world scenarios and water wading. Next we could drive the Nanos on an infinity shaped test track, to check its maneuverability. I also spotted lots of Open Top Nanos and a Nano with Sunroof. Have written separate post about them. Also icing on the cake is spotting a Tata Nano that I had driven during 2010 Superdrive event. This visit has been very memorable and thanks to Tata Motors for putting together such an event with extreme precision and providing a royal treat and experience to #TheChosenOnes. Video is in the making, will upload in a day's time. 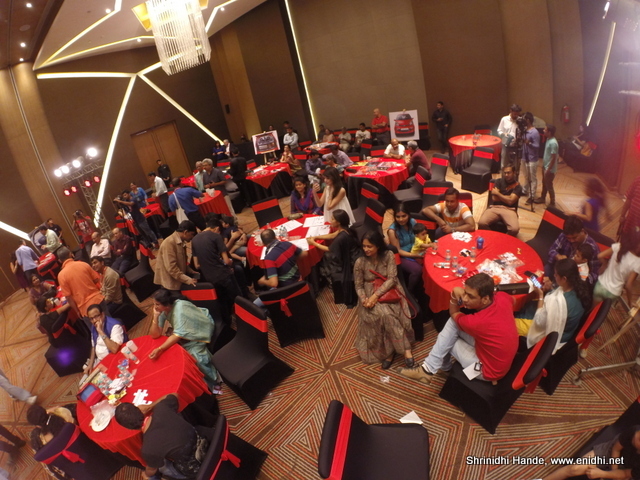 Great to see more photos in your post, Shrinidhi! When I returned home from the trip and saw an update from your blog, I headed over to see and was stunned to see you had already published a couple of posts! So impressed! What a wonderful feeling it must be to literally track the history of Tata's cars - it was my second Tata event and I thoroughly enjoyed it! Nano ko mano - the right choice. @Vidya: I prepared those posts at airport and published them once I reached home- they were bit simple posts.. I liked the OK sticker too. I should have taken one. 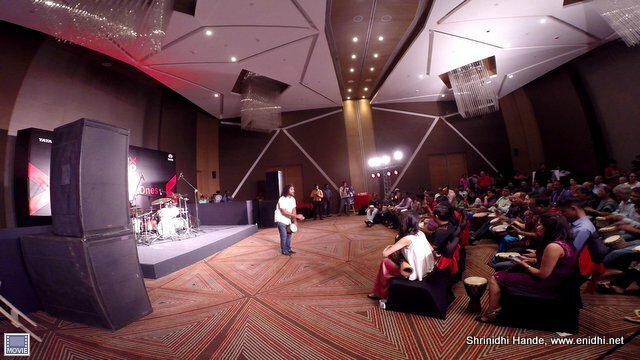 Great post Shrinidhi, it is always a pleasure to read another person's view of the same event. Well covered.